An extremely quiet week at work lent itself to some quiet reading nights! But a weekend with a sweet little visitor - my niece Emma, the reading during the weekend didn't happen! But we made some memories! I want to read Catching Air--has been on my wishlist awaiting its release. The Collector of Dying Breaths has gotten rave reviews from other bloggers I visit, so that one is on my wishlist also. 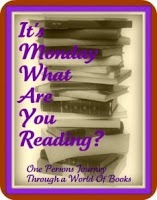 Have a great week, enjoy your reading.